How far can you get…digitally? This entry was first posted at Re: Generations. I was recently asked by a senior administrator at my university why the library still buys books. Everything’s going digital, he told me. Why don’t we just get some iPads and stop buying books that we have to process, store, circulate, mend, and replace? Books cost a lot of money. If we became an all-digital library, surely we’d save money. This was a very quick conversation, so I answered him as briefly as I could: yes, some disciplines have adopted digital formats. Others, like the architecture department that I work with closely, have not. We buy electronic materials for the disciplines that use them, and print for disciplines that prefer print. We aim to please. But the question stayed with me, and for the last few days it’s been collecting lint in my brain. I’m particularly stuck on it, I think, because this was a senior administrator, someone with decision-making power (not directly over the Library, but still a decision-maker at the institution.) I think it’s been a wake-up call to me that just because I think I have a fairly balanced understanding of where we stand, digital-content-wise, that doesn’t mean that others do. And it’s also forced me to re-examine some of what I thought I understood about digital content and new media. Our print circulation stats, like the print circulation stats of all ARL libraries, are declining. I think the last stat I heard was that print circulation accounts for eight percent of our overall circulation. (Don’t quote me on that, but I think it’s right.) That figure startled me. Eight percent? The millions of volumes of books, documents, bound journals, all those years and years of buying and building a research-level collection–and it’s less than ten percent of our overall circulation? And dropping? Wow. Well, surely that means that users are getting access to those books, documents, and bound journals electronically, right? They’re still using all the same materials, they’re just shifting to online access. Except…I know for a fact that most of the scholarly books we buy today aren’t available online. We do occasionally buy access to an e-book version of a print book, but since that costs more than buying one format alone, usually we only buy one or the other. So if a book is on the shelf, chances are very good we don’t have it electronically. Not to mention, many of the books we buy just aren’t offered as e-books. For all that we talk about going digital, the scholarly book market is still (in many disciplines) very print-based. But hey, government documents are largely e-only now…at least the current ones. (Which raises all sorts of issues about archiving, discovery, and access, by the way.) But the older documents, the ones that fill the shelves in our library, are often only print. It’s rare for a government agency to spend money on digitizing its print archive, because there’s always somewhere else that money could go–into servers hosting new documents, for instance. Some of our bound journals are definitely available digitally, thanks to Project Muse, JSTOR, and other digital publishers and archives. 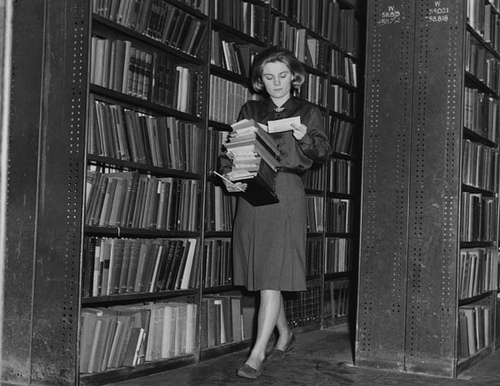 In fact, many libraries see old issues of JSTOR and Project Muse journals as the low-hanging fruit that can be moved to offsite repositories when the library’s shelves fill up. But other journal back runs aren’t available online, as anyone who’s ever done a research project knows. And we still get plenty of current subscriptions in print, either because there’s no online version available, or because publishers bundle online + digital as a package price (with penalties for canceling one or the other), or because we’ve made consortial agreements to keep a particular title in exchange for another library keeping a different one, or because our users see value in the print version and don’t want us to cancel it. Other people have done actual studies on electronic access versus print access–who’s using what, how often, and sometimes even why. I can’t claim to have done research on this, but based on everything above, I think it’s fair to say that declining print stats can’t mean that users are just migrating to digital access of the same materials. Some of that material–a lot of it–isn’t there for them to access in the first place. We do know that new kinds of digital resources are getting lots of use–our digital image collections, institutional repositories, and special collections & archives projects are seeing increased use as other types of use are decreasing. But does any of this prove anything about the viability of a digital-only library? I don’t know, but here’s a thought experiment: pick a research project, and see how far you can go with it if you use only materials that are available to you digitally. That means no books off the shelf, no old newspaper articles, no browsing images in the current journals. I’m still playing with this, but it’s fascinating to see how different kinds of projects would do (even hypothetically) in an e-only library. Here’s an example: a research project on the experiences of first-generation (issei) Japanese immigrants to Washington state at the turn of the 19th century. Online, I can get some great images from Washington and California digital repositories. I can get a few relevant Wikipedia articles (with citations pointing me to print sources.) I can get some full-text articles from our online databases. I can get historical New York Times articles from ProQuest. I can’t get any books off our shelves, even though we have plenty. I can’t get any of the articles I find in America: History and Life that are only available in print. At my own library (YMMV) I can’t get historical newspaper articles from any West Coast newspapers. I can’t get any of the photos, personal narratives, maps, drawings, or references that are in those sources. Basically, I estimate that I can get about a quarter to a third of a decent starting picture on a project like this. I’m left with gaping holes in my research, and a lot of ILL requests to make. And since ILL requests cost money, the institution is now paying money to borrow items that it could otherwise pay to own. I’m not nostalgic about the days when libraries had nothing but print indexes and card catalogs–I’m old enough to remember them, and they weren’t fast or easy to use. I’m strongly in favor of making our cultural heritage (and currency) accessible to all, as quickly and transparently as possible. But even though we’re entering the Age of the Digital, we’re not fully there yet. We still need print, and I expect we will for many years to come. And as for the question of whether we’ll ever be able to just buy a few iPads and sit back to count our savings, secure in the knowledge that our users will be able to find, filter, and synthesize what they need–well, I wouldn’t bet on it. 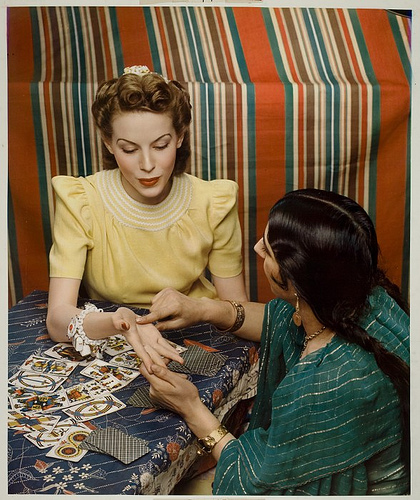 Image courtesy George Eastman House via Flickr Commons. First of all: there is one. And if it’s at least part in new media, who better to talk about it than the estimable Annalee Newitz, editor of io9.com? Newitz covers the ground from 19th-century muckrakers to WikiLeaks, including crowdsourcing, Ushahidi, and 4chan. This talk, given at the Chaos Communication Congress in Berlin, conveys some of Newitz’s characteristic curiosity and humor. Food for thought for librarians, journalists, and everyone else who worries that the demise of old media traditions might be tanking our habits, assumptions, and jobs.